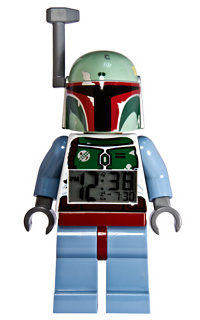 We looked at Captain Rex making his debut as an alarm clock in the form of a LEGO minifigure, and here we have someone from the baddies group – Boba Fett, all decked out in LEGO minifigure glory as well. This £26.49 purchase will feature the galaxy’s most feared bounty hunter (during the time of Episode V, of course), where this LCD alarm clock is an officially licensed product for you to contribute your hard earned money to George Lucas’ moneybags. Heck, this tie up with LEGO has resulted in a cute looking alarm clock that boasts of a no-nonsense performance to help you get out of bed during those nice and cool mornings where you just want to pull the sheets over your head and get slightly more than forty winks. Nice to know that the all important snooze function has been thrown into the mix alongside a backlight to help you tell the time in the dark – both of which are activated simply by pushing his helmeted head down. Heck, you can also adjust Boba’s hands and legs to strike the perfect wake up pose.